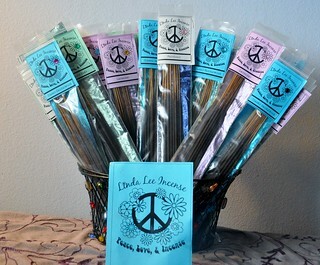 LindaLee Incense - Peace! Love! Incense! I didn’t say anything out loud, but I thought to myself, “That’s me! I smell like incense!.” And I guess I do, although I can’t tell and my friends must be used to it, because they don’t say anything anymore. People have been burning incense for thousands of years, and I’ve been burning it for over forty. I like to shop for it, see what’s new, sniff the packages, roll the sticks between my fingers. I burn sticks and cones and ropes, logs, bundles of branches and resin on hot charcoal. I burn it at home, at work, I travel with it. Then, about fifteen years ago, I started making incense. One summer a friend and I gathered fresh pine needles by a lake in Northern Minnesota, and I took them home, dried them, crushed them, made a few dozen fragrant cones. It was the most exquisite pine incense, but not practical, for someone like me who burns a lot of it. So I started experimenting with differnt oils and mixtures, and techniques, and came up with an affordable, delicious incense that I burn all the time and never get tired of. And now, I am selling that incense here. I picked my favorite four scents: Sandalwood, Patchouli, Lavender and Sage. These are the ones I enjoy and the ones I share with friends. I make them in very small batches, and you will appreciate the freshness. 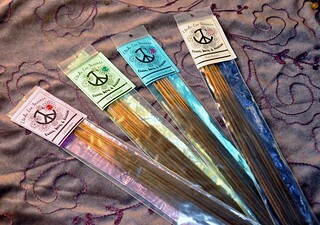 The incense is $3.00 per pack of 15 sticks. Shipping is 25 cents a package. I hope you’ll try some; I think you’ll like it! Let me know what you think. If you don’t want to pay through PayPal, you can send a check to me at Linda Banks, P.O. 1132, Erie, Colorado 80516, along with a note about how many packs, and what scents you want to try. Also, if you would like to sell Linda Lee incense in your store, or sell it as part of your school or group’s fundraising efforts, e-mail me and I will send you wholesale information. Mmmm, things that smell good. Check out my blog, the Incense Den, with news, photos and stories about incense, perfume, soaps, aromatherapy and all things that smell good.